Large cities often get a bad rap, but on so me level they can all be separated into sections that might as well be small villages. Of course they can also be separated into places where I would never want to leave my car, but I still feel safe there. What I love about large cities is that they can surprise you, for better and for worse, but sometimes for better. This is one of those “for better” stories. I guess I’ve gotten used to upstate New York. After living here for over 13 years it’s only natural. When I first arrived here (after spending the vast majority of my life living in Philadelphia) I remember keeping my head down while passing people on the street, never making eye contact, and not lifting my head until I was well past and I could breathe a sigh of relief. Knowing they hadn’t mugged me even though they’d had the chance. But I noticed something strange early on. Living in a small village means talking to people when they pass on the street. The first time someone made eye contact I felt uncomfortable. I mean, what was her problem? Didn’t she know that’s not how human beings react? I was 3 steps past her when it finally hit me that not only had she made eye contact, but she had also said something out loud. It took me another 5 steps before it hit me that she had said “Hi.” Was she hitting on me? Was she lulling me into a false sense of security? By then, though, it didn’t matter because she was gone, down to the next block, and I was left perplexed. Eventually I got used to the program. In small towns if I didn’t talk to people as they passed me on the sidewalk that was the odd thing. If I didn’t at least acknowledge the other person’s presence with a head nod (down, not up) that would the gossip around town for at least a week. I got hip with the groove, and I started being the first one to say “Hi,” in those exchanges. I felt like the mayor of the town, but I got used to it. Yet, anytime I go back “home” (to Philadelphia) I am reminded of how I used to think. It all comes back in a rush when I’m walking the streets of South Philly, when I pass by a guy moving quickly with his head down. I almost give him a standard greeting, but then I catch myself at the last possible second, knowing it will be greeted with derision if not ignored outright. And it makes me sad, to feel like small towns are the last refuge of decent human connections. But yesterday — yesterday was a different story. 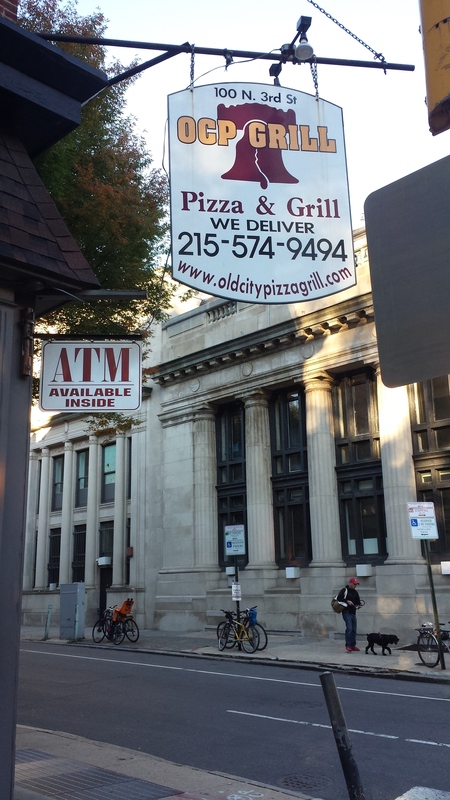 I went for a walk in downtown Philadelphia with my head down and my radar up, just like the old days, but I was hungry so I stopped at a pizza place. It was old-fashioned and authentically Italian, or at least as far as I could tell. The meal was uninspired, though, but how inspiring could veggie pizza be anyway? And I was ready to go when I heard one of my favorite songs come over the restaurant’s stereo system. Now you know that when I hear one of my jams I have got to sing along with it, so I started bopping my head and singing along with the lyrics. I absolutely felt like I was Adam Levine on stage leading the band. That’s when I saw her. She was standing by a table near the door wearing a long blue dress cinched at the waist with one of those large black belts that are all the rage again. And she singing too. Quietly, but it was still clear. We nodded to each other, each smiling once more, then I walked out of the restaurant and stood on the corner, thinking to myself how small the world can be. When we let it.